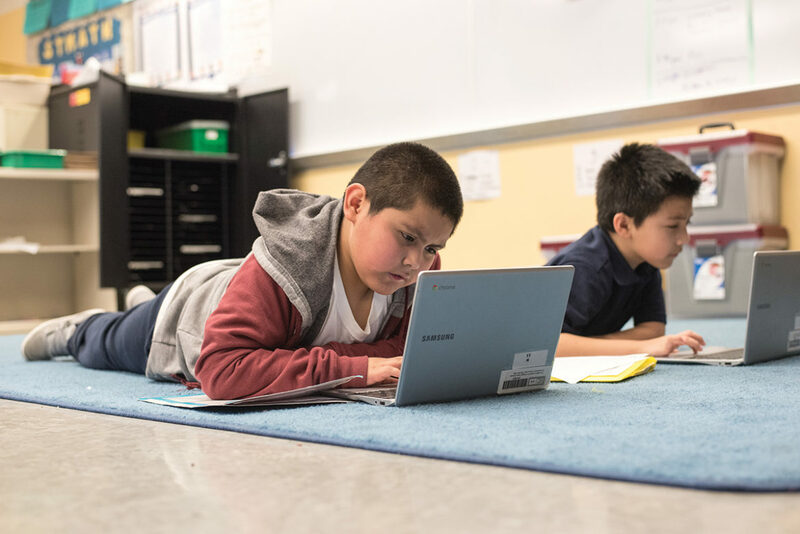 Under the tenets of personalized learning, students, like these third-graders at Chavez Multicultural Academic Center, work where they feel most comfortable, whether that’s on the floor or at a desk. Six years ago, Chavez Multicultural Academic Center joined a district pilot program aimed at giving students more time in school in order to improve their academic performance. The pilot gave Chavez, located in the Back of the Yards neighborhood, an extra 90 minutes for its school day and a computer for nearly every student. Many teachers worked the extra time for a lower hourly wage, paid through the YMCA, so they could help students master the new software for math and literacy that the program provided. A year later, Chavez moved up to the district’s highest academic rating. So when the pilot ended, Principal Barton Dassinger and his staff decided to keep it going. Dassigner used part of the school’s discretionary budget to pay teachers at their union rate for an extra hour of work four days a week to continue helping students use the software. Over time, teachers began to incorporate it into lessons during the regular school day. Chavez is now considered a “model” neighborhood school for personalized learning, which aims to give each student unique lessons based on their abilities and relies on technology that adapts as students move through progressively challenging lessons. Dozens of educators from Chicago and across the country visit Chavez each year to learn its strategies. This personalized learning approach is part of a growing national trend that CPS wants more schools to adopt. There’s a big roadblock to that, however: Money. Like Chavez, other schools that are considered models have gotten hundreds of thousands of dollars in outside grants to train teachers, buy technology and even purchase new furniture to outfit classrooms. These schools also tend to have veteran principals and less teacher turnover. Some have longer school days or have transformed schedules to carve out time for teachers to collaborate on lesson planning and get coaching. Many model schools also have received extensive teacher training and funding from LEAP Innovations, a Chicago nonprofit that helps schools vet products and implement personalized learning. Through their signature program, Breakthrough Schools, they’ve committed to give $4.5 million to 22 schools. This fall, the district says it wants to follow in LEAP’s footsteps by providing training and technology to a small group of principals and teachers from schools that want to implement personalized learning. But as CPS faces one of the worst deficits in its history, the district has yet to provide any details on how it plans to pay for the support. Even so, the district is now drafting a personalized learning framework to encourage principals to consider the model. It’s also looking to hire an “executive director of personalized learning,” and plans to open a model classroom in Dyett High School when it re-opens this fall. “We want to create not only an overall vision and framework for personalized learning, but we want to help principals and teams identify entry points, if this is a direction that they would like to go,” says Chief Education Officer Janice Jackson. One of the most visually striking characteristics at some schools are the big, open spaces — taking the place of smaller, traditional classrooms — filled with large numbers of students who work in small groups or on their own, under the direction of two or three teachers. Perhaps the best example is Intrinsic, a charter middle and high school in the Northwest Side that opened in 2014 with this type of layout. The furniture, too, is non-traditional, including desks with wheels that students can easily move around. During a visit to a ninth-grade English class, about 60 students were split into four groups in one of the spaces. The groups rotated every 30 minutes among a team of three teachers, each of whom taught different aspects of that day’s theme: dystopias and utopias. Students in the fourth group read independently against a back wall. Every student at Intrinsic has a Chromebook that he or she can take home. But even though technology is an integral part of learning, it isn’t used all the time in every class. One group in the English class worked the old-school way: writing their analyses and annotations of a text by hand on printed handouts. Their experience echoes research suggesting that people absorb information better when it is read in print. One recent, small-scale study found that adults who read a short story in print recalled information more accurately than those who read the same story in digital form. It’s not uncommon to see students of varying ages and grade levels working in the same classroom in these schools. Students advance as they master skills, rather than simply progressing according to a set calendar. That could mean a third-grader who is struggling with reading gets extra phonics help with a first-grade teacher, while advanced students travel to a selective-enrollment high school to take math classes. At Belmont-Cragin Elementary, some students will get a chance to work on their own personal projects. Earlier this winter, the staff emptied out an old computer lab and converted it into a “maker’s space.” The room has large tables for students to build projects with materials like Lego blocks that teachers have won through private grants. Teacher Jason Pitak is also applying for another grant to buy a 3-D printer. The idea, he says, is to give advanced students in the middle grades the chance to finish their weekly assignments early and spend Fridays in this room working on projects. When students work at their own pace, teachers need time to review their progress and figure out if and when students need to be regrouped. Teachers at the West Belden campus of the Chicago International Charter School network get 90 minutes in the middle of the day to meet and do that. To decide which students need to be put into new groups, based on their mastery of certain skills, teachers rely on their own classroom observations and check “exit tickets” — quick, ungraded assignments — that demonstrate whether students understood the prior day’s lesson. Then they decide which students need to move where. Four instructional coaches help teachers plan and can step in to conduct lessons when teachers are observing one another. The school also dismisses students early on Wednesdays to give staff another 90 minutes of planning time. Many schools create individual profiles that list students’ academic strengths and weaknesses, outline how they prefer to learn and set goals for improvement. At Chicago International Charter School’s West Belden campus, profiles are developed after teachers hold conferences with students and parents weigh in. In one example, David Diaz, a fifth-grader, told his teacher that he likes to build with his hands and do research on his own. He also prefers to show what he knows using technology, like creating a slideshow on his Chromebook. David says his positive attitude is a strength, while math and staying focused are areas he’s working on. David’s parents also let his teacher know that he sometimes chooses books that are too easy. His teacher urged him to pick books that are more challenging — “like Divergent and Hunger Games,” David says. Schools that commit to personalized learning often navigate complex sets of data as they try to understand how well students are performing. Dassinger’s massive spreadsheet at Chavez is famous among principals — one described it as “mad genius” — and even impressed CEO Claypool on a recent visit. It includes student demographics; metrics like attendance, grades and test scores; and how well students are doing on ed tech programs. It also groups students into five categories, based on how likely they are to drop out once they get to high school, giving teachers a more nuanced picture than the district’s metric, which simply shows whether or not students are on track to graduate on time. The Chavez principal updates the spreadsheet every few days and shares it weekly with teachers, who use it to tweak their instruction based on students’ achievement. Students keep track of their achievement data in a folder, and the school is working to make this available to them electronically. Counselors use the data in meetings with families the summer before students enter seventh grade, so they can discuss high school options. The admissions criteria for selective high schools rely heavily on seventh-grade performance. The school wants to do for low-income families, he says, what wealthy families can do with pricey private coaches. CPS schools that bought ed tech products in 2015 spent an average of $30 per student, but the impact on achievement is still in question.